This article shares research into the brain and Myalgic Encephalomyelitis (the chronic illness known as ME and CFS). Many of us living with ME experience cognitive difficulties, and what is often known as brain fog. Noticing these symptoms, some scientists have chosen to research the brains of those living with Myalgic Encephalomyelitis. When: December 2018 with results to be published in early 2019. Look out for “Brain imaging and behavior”. Who: Jarred Younger PhD, director of the Neuroinflammation, pain and fatigue laboratory. 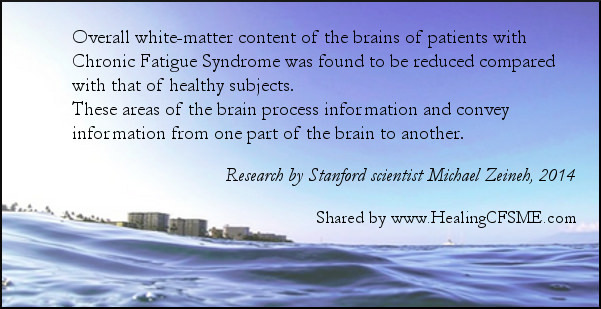 Result: Overall white-matter content of CFS patients’ brains was reduced compared with that of healthy subjects’. These are areas which process information and convey information from one part of the brain to another. 2) Method: Advanced imaging technique – diffusion-tensor imaging. Result: A consistent abnormality in a particular part of a nerve tract in the right hemisphere of CFS patients’ brains. A fairly strong correlation with the abnormality revealed above and the level of illness of the patient. 3) A thickening of the gray matter at the two areas of the brain connected by the right arcuate fasciculus in the CFS patients, an observation which corresponds with the abnormality in the white matter joining them. Size of survey: 15 patients with ME. Follow up: At the time of writing, the Stanford scientists were planning a larger study. An MRI brain scan I had done back in 2002 showed "The frontal cerebral sulci appear a little prominent". I wonder if this is a connected result. Myalgic Encephalomyelitis and CFS affect between 1 million and 4 million individuals in the United States. In the UK the estimate is 250,000 of which one quarter are housebound or bedbound. This was a small study. Nonetheless PET scans showed significant increases in inflammation in certain regions of the brains of CFS patients who satisfied the criteria for Myalgic Encephalomyelitis. Who? - Yasuyoshi Watanabe, director of the RIKEN Center for Life Science Technologies. 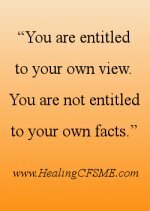 If you are aware of significant research on CFS/ME and the brain which is not included here, I would be grateful if you share the news in the forum. 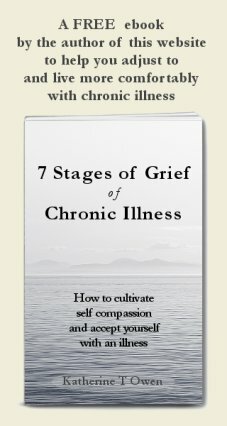 Read a full list of the research I have shared on the biology of Myalgic Encephalomyelitis and Chronic Fatigue Syndrome.